In most states including in the US, employers are required to pay employees, either monthly, semi monthly, bi-weekly or weekly. When creating a payroll, one of the key decisions to make is the frequency of payments. This decision will have ramifications on the employees and your accounting and finance departments. Bi-weekly payments is where the employees are given the paycheck after every fortnight or an equivalent of 26 times a year. 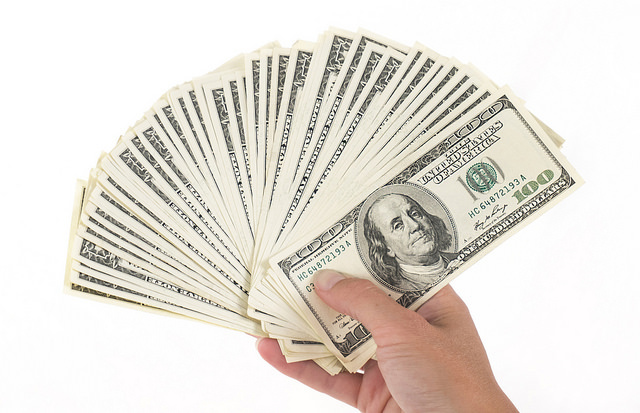 Semimonthly payments is where the employee receives the paycheck the employee is paid 24 times in a year. In a bi-weekly payroll approach, employees receive the pay-check after every two weeks. This is usually on a specific day of the week. In this approach they will receive 3 paychecks in two months of the year and two paychecks in the rest of the months. One of the greatest drawbacks of this payment system is that it doesn’t coincide with the calendar which may lead to great confusion to the accounting and finance departments. The bi-weekly approach causes great havoc to budgets and cost analysis of companies. This is because a year has 52 weeks and they are not all well divided within the 12 months. Some months will have three paydays while others will have two. This approach is much more complicated than the monthly payroll. In this approach the employees receive the payments twice a month. This is only done on the 15th day and the last day of a month. In this system the payments are less often when compared to the bi-weekly. This is because only twenty four payments are done within a year. However most companies ensure that in whichever approach the salary remains the same. For example, if company X hires a senior manager and pays $60,000 per year. In the bi-weekly approach the employee will be paid $60,000/26 = $2,307 and in the semi-monthly approach the same employee will be paid $60,000/24 = $2,500. In a bi-weekly approach, the employee is paid after every fortnight while in the semi-monthly approach payments are done twice a month this can be on the 15th and last date of a month. 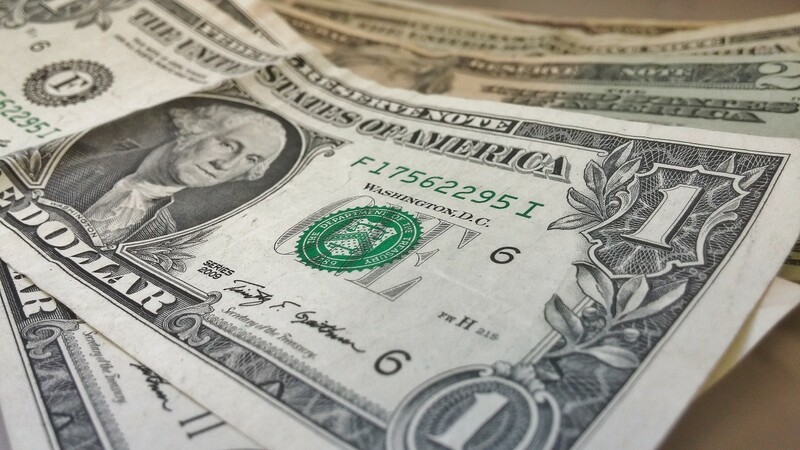 Employee prefer the bi-weekly payment system as it much easier to determine payment dates since the days of the week are usually listed e.g Friday. It is very hard to determine the payment days in a semi-monthly approach as the day of the week keeps changing since it the 15th day and the last day of the month. One may need to sit down with a calendar to tabulate. Employees prefer the semi-monthly system as it is much easier to do the cost analysis and monthly budgeting. This is because the payments per month remain constant. It is more complicated to do the cost analysis and budgeting for bi-weekly payouts as some months will have three payment dates. The payroll processing differs in that the full-time bi-weekly paid employees are compensated for 80 hours on each pay date. On the other hand, the semi-monthly approach compensates the employees for 86.67 hours on every pay date. The employer arrives at the hours for the bi-weekly approach by dividing 2,080 hours by 26 days. For the employer to arrive at the hours on a semi-monthly approach they divide 2080 hours by 24 days. The pay periods for the bi-weekly approach can amount to 26 or 27 pay periods yearly. This is because some years have 366 days while others have 365. The pay periods in a semi-monthly approach total to 24 times as payments are only done twice a month. The payroll processing on the semi-monthly system is not as straightforward as that of the bi-weekly system. In a biweekly hourly paid system, payments are done on the number of hours an employee has worked over the last 14 days. In a semi-monthly system, employees provide a payroll calendar which contains the time cards that should be filled and submitted within each period. Since some months have 30 and others 31 days, employees in the semi-monthly hourly salaried system will often receive payments for different numbers of days. Bi-weekly and Semi-monthly approaches are both payment systems applied by employees globally. The bi-weekly payment system involves paying employees after every 14 days. The semi-monthly approach involves making payments twice a month. A bi-weekly system has 26 or 27 payment dates in a year. On the other hand a semi-monthly system has 24 pay dates yearly. The difference in number of pay dates is offset by dividing the yearly salary by the pay periods or the yearly hours by the pay periods. On average on the bi-weekly system compensates the employer for 86.7 hours on each pay period. The semi-monthly system compensates the employer for 80 hours on each pay period. Employees prefer a bi-weekly approach as the days of the week are easy to determine. Employers prefer the semi-monthly approach as the budgeting is easier. Evah Kungu. 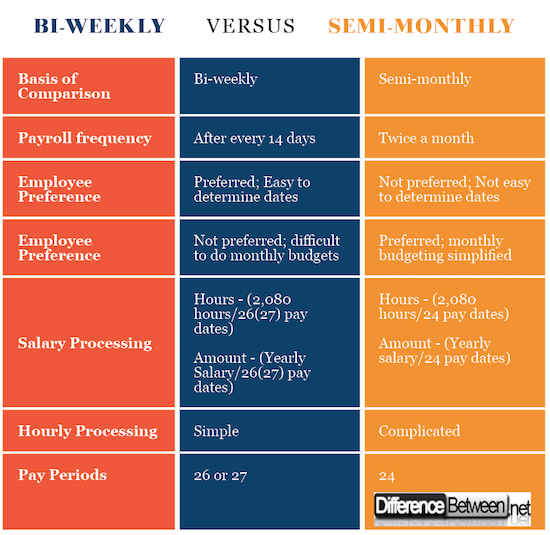 "Difference Between Bi-weekly and Semi-monthly." DifferenceBetween.net. May 17, 2018 < http://www.differencebetween.net/business/difference-between-bi-weekly-and-semi-monthly/ >. Statistics, United States Bureau of Labor. Area Wage Surveys: Selected Metropolitan Areas; Occupational Earnings; Supplementary Provisions. U.S. Department of Labor, Bureau of Labor Statistics; for sale by the Supt. of Docs., U.S. Govt Print. Off., 1968. Gilbertson, Claudia Bienias, et al. Century 21 Accounting: Multicolumn Journal, Introductory Course, Chapters 1-17. Cengage Learning, 2013. Service, United States Internal Revenue. Your Federal Income Tax for Individuals. 1955.